Nothing compares to the time spent interviewing relatives who might be able to add a significant amount of details to your family history. Yet, you must approach each relative in an easy going manner as so not to appear as some ‘hard hitting reporter for the newspaper’. Use some of the following suggested approaches to get started and you will reap possibility some benefits. If possible the best way is in-person, face-to-face meeting with the relative. Never just surprise them at their house, call ahead and make arrangements for when it is convenient for them. Explain why you are gathering the information and plan for a maximum length of about 1 to 2 hours. Next be prepared with what type of information you would like to know. Never ask for the person to tell you ‘everything they know about your grandmother’. That is overwhelming. It is best to ask questions about just one individual or couple (husband and wife) and covering just a certain time span, like when the couple got engaged and married. If you have a photo of the person or a specific event like a wedding, bring that photo. It will really spark the conversion. The interviewed relative should be familiar with the ancestor you are asking about, if they appear not to know much, do have a back-up ancestor’s name and questions written out ahead of time. When asking a question and the relative states they don’t remember, move on to the next question and possibility come back to the missed question and rephrase it. Their memory may be sparked by then. Have some of your earlier research (dates, places) on that ancestor with you, beside the photo or photos, that will help trigger their memory. There is always the case where a relative just doesn’t want to discuss a certain topic or even person. Respect their wishes; it may have been a painful period in the family’s life. If that happens a good alternative is to ask more questions about the relative being interviewed. Most everyone does like to talk about themselves. 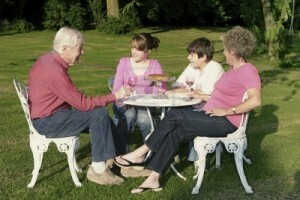 Ask about the relative about their life, their education, occupations, children or hobbies, etc. Again, keep it to just a couple topics. You can return another day to cover other areas with them. Have a notebook in which to write some notes to their responses, but also have a tape recorder running. Then, you will have every word. Most will not want to be video recorded with their image, but ask, they might not mind. There is a very rich source of stories, photos and remembrances to be gathered from your living relatives, make the effort and save what is gathered for the upcoming generations.